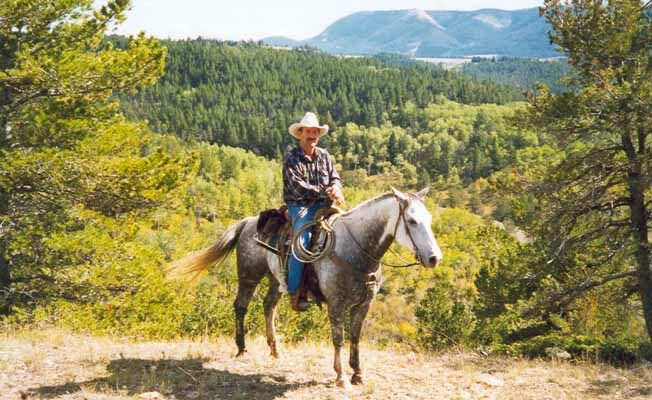 Lonesome Spur Ranch is a fifth generation working ranch, 45 miles south of Billings on Highway 310, between the Beartooth and Pryor Mountain Ranges. We invite you to join our family and take part in ranching activities as the season demands. Throughout the year we are working with our horses and cattle. Spring sees us calving and foaling our home-bred stock. Summer and autumn gets busy with training our colts, checking cattle and our mares at pasture. Whilst out riding you'll probably see all kinds of north American wildlife - whitetail deer, mule deer, eagles and sometimes elk and bears, so be sure to bring your camera! In addition to our everyday activities our guests are also given the opportunity of participating in horseback activities such as team penning cutting, sorting, team roping and fun games on horseback, all in the safety of our large arena. We now have a spa facility that guests can enjoy after a hard day's play on the ranch. Soak sore muscles away in our Catalina spa hot tub, try a relaxing massage with essential oils or perhaps a warm soothing aloe vera wax treatment for weary hands and feet. Air conditioning, heating, fruit, drinks, snacks and toiletries provided in all rooms. We are open all year. There is available skiing nearby, which we will arrange and accompany you on ski trips, providing transport to and from the ski area. Winter horseback riding on the ranch is also available.